Overlays are used for resurfacing existing concrete floors. 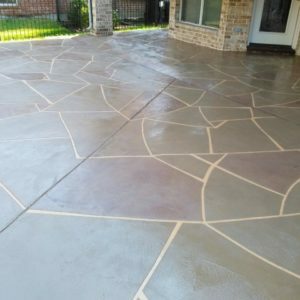 It’s a great material to resurface pea gravel, chipped concrete (not cracked), rough concrete or even an existing decorative concrete floor. With so many brands available, we only use the brands of the highest quality that have been tested and used in the homes of the Flores Decorative Concrete employees. There are so many things you can do with Overlays, let us know what ideas you have. There are so many things you can do with overlays! Want to turn your back patio into little abstract art? We can get that done, give us what patterns you like and we will get them on the floor! 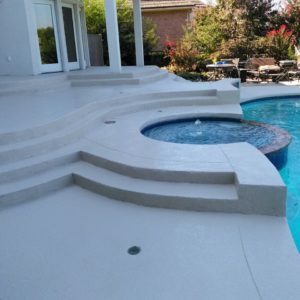 Have a pool deck that currently has a flaking spray deck texture, pea gravel or bare concrete? We can repair old beaten and flaking spray decks with overlay. Tired of the Pea gravel concrete? No problem we can resurface it with overlay and apply spray texture over it! Watch bare concrete pool deck get turned into a colorful deck! 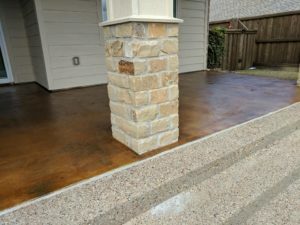 Have a really rough concrete patio? Let us resurface it with overlay and completely transform it into a thing of beauty. Give life back to your patio areas!